Click here to go to the Gomers’ Merch page and download the episode! It’s been the Gomers’ ambition, ever since they both had kids in the mix, to record a special podcast about being Dads, living life, staying healthy, and remaining sane. 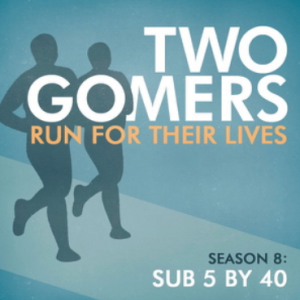 Now, after weeks of planning and hours and hours of recording, they present to you their 2012 Special Episode, Two Gomers Choose Wisely. And as you might expect, the episode covers a wide range of topics, including running. Join the guys as they take an honest look at comparing and judging, making time for important things, deciding what those important things are, life “majors and minors,” finding creative “me times,” chasing and deferring dreams, and doing housework. All this from that one scene in Indiana Jones! Remember, this is also the Gomers’ annual fundraising episode. So please, if the podcast has inspired, motivated, or entertained you, consider giving when you download. As always, the guys REALLY appreciate it and couldn’t do it without you! Happy Downloading, donating, and running! Hi gomers! I am totally late to the party, but I just purchased the special and am so excited to listen; my husband and I (both runners) are expecting our first child in September, so I am hoping to get some great insights and some solid laughs. As always, thanks for everything!